Posted by Jon in Hasbro, Lists, Marvel Legends with 0 comments. While I’d imagine most people are partying in the New Year, I’m sitting here taking pictures of toys and formulating them into a list. Envy me! Anyways, back at it again for the yearly Marvel Legends Top 10! This has been quite a year for the Hasbro toy line with, at my best count, 95 figures released within the calendar year in the six-inch series. I’m almost embarrassed to admit that I bought every single one, and then went back and double dipped during clearance sales and the like. 10. 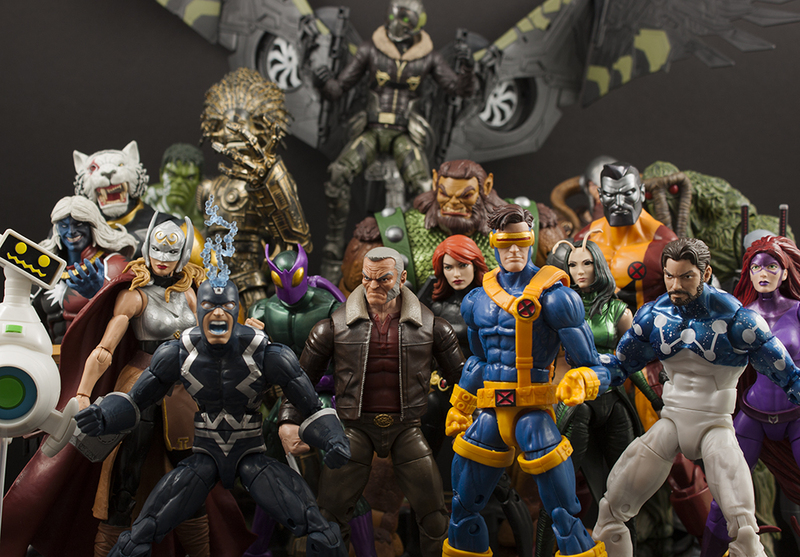 12-Inch Marvel Legends – Twelve-inch Marvel Legends are good now? It only took one Wolverine and some clearance sales. Now, all of a sudden I have a shelf dedicated to Hasbro’s 1/6 scale Marvel Legends collection. One of the biggest draws of this line is the accessories. Each character comes with a mess of alternate heads, hands, and weapons. These are the kinds of things I’d love to see Hasbro integrate into the six-inch line with more regularity. Now this is probably a slightly skewed “best of” because despite loving the ever living crap out of this Hulk, there is no way I would have bought him at the MSRP of around $75. Amazon eventually lowered his price down to $35, and I felt this was more than acceptable a price for a 14-inch Hulk action figure that feels like it weighs ten pounds. This Hulk also does Hulk right by giving us a set of open hands and fists. For some reason getting a Hulk figure with two fists in Marvel Legends has been an exception rather than the rule. Wolverine I was willing to pay MSRP for, because he’s probably one of the best looking Wolverine figures in the Marvel Legends toy line. 9. MCU Hela – Confession time: I still haven’t seen Thor: Ragnarok. At this point I’m content just waiting for the Blu-Ray release. That in no way stops me from thinking that Hela is one of the most gorgeous female MCU figures ever made. Black Widow is great and I love her to death, but for the most part she’s just in a tactical suit. I thought was one of the reasons that everybody hated the X-Men movies? However, Hela is in a straight up costume, and the horns on her helmet are a thing of beauty. The face printing even subtly shows the black veins in her forehead. 8. Face Printing – What? That’s not a Marvel Legend! No, but the transition this year into printing faces on movie Marvel Legends is a game changer and deserves a spot. It started with the early year’s Guardians of the Galaxy wave, and by the time we got to the recent Black Panther series the likenesses started to get downright scary good. Mind you, the process certainly hasn’t been perfect. Sometimes there are misses such as the Chadwick Boseman face on the latest Black Panther. However, just dig up a Star-Lord from the 2014 set and compare it to the 2017 version to see how far we’ve come. I’m also amazed that Marvel was the first team at Hasbro to use this process. Star Wars is just about 100% movie characters and actors, so how they are a year behind Marvel in this technology is beyond me. I suppose the Marvel Legends team just cares about us collectors a little more. What? Hey I wonder what happened to my Star Wars invite at Toy Fair? 7. A-Force Box Set – Judging by the stacks of these box sets I see sitting around my local Toys R Us, this may not have been the most financially sound decision in the world. However, I applaud Hasbro for at least giving it a go! The exclusive certainly had an uphill battle to fight judging by the Toy Fair announcement’s immediate reaction was people trying to figure out who the actual characters in the set were. And in case you still don’t know, the A-Force box set was a Toys R Us exclusive that included five women: Singularity, Loki, Sif, Monica Rambeau, Elsa Bloodstone, and She-Hulk. Of those five characters, I’d wager maybe two of them could hold up as a single-carded release: Monica and She-Hulk. The rest, I highly doubt. Personally I was excited to add two more members to my Nextwave shelf. Okay so I lied, I don’t really have a Nextwave shelf. But that’s just because I currently keep all of my figures in storage. I wish I had a cool display like all of you guys. Be my friend and invite me over to play? Please? 6. Adam Warlock – Adam Warlock is a pretty great update to the early Hasbro version. He’s also neat because with the additional head he can become Magus. Adam is a fairly simple update which didn’t take a lot of new tooling, but in its simplicity the figure just clicked with me. I would have probably rated it a little higher had he come with an Infinity Gauntlet and some alternate hands. 5. Guardians of the Galaxy – Through the use of two waves, a build-a-figure, an exclusive, and a two-pack Hasbro managed to get us the entire main cast of the Guardians of the Galaxy movie within the same year. Which seems like a first for movie Marvel Legends. We’ll generally get a select few characters from a movie release, and maybe hope for some more down the line (*cough* Vision *cough*). But this time, right out of the gates we get Star-Lord, Drax, Gamora, Baby Groot, Rocket, Nebula, Yondu, Mantis, and Ego. Sure, we didn’t get Sean Gunn or Taserface, but we did get a strong lineup of mostly original sculpts in a day and age where companies are trying to take advantage of as much reuse as possible. Hasbro also did a really good job with Spider-Man: Homecoming, but the costumed character pool was a lot smaller. While the wing set we built was very impressive, I’m still a little bit cross that we don’t have a Michael Keaton Vulture head to go with it. 4. Dazzler – I’m willing to bet that if my buddy Matt from AwesomeToyBlog was building a list, this figure would likely be ranked higher. Believe it or not, this is the first Dazzler figure in the six-inch Marvel Legends line. I’ve ranked it high not only because it’s the first, but because of the era they chose for her. If you told me Hasbro had a Dazzler figure in development, my guess would either be a modern version or A-Force. Instead they went way back and made a first appearance disco Dazzler, complete with roller skates, bell bottoms, poofy 70’s hair, and a microphone. It’s a fabulous figure. Everyone should own it. 3. Bullseye – They say the accessories make the man, and in this case it’s 100% true. Bullseye is already a great remake of an aging Toy Biz sculpt. Where he really shines are the two amazing head sculpts and great selection of hands. Just take a gander at that crazy, cackling head sculpt! Unless proven otherwise, this could easily pass as the definitive comic Bullseye figure. 2. Human Torch and Invisible Woman – I’m putting these two together because it’s my list and I’ll do as I please! That and it’s just so nice to actually have a Fantastic Four team being built again. I was able to snag Invisible Woman very early in the year, and she still holds up as one of my favorite modern females in the line. While I think Sue with H.E.R.B.I.E. is the better release, Human Torch still stands tall as a great update to that character as well. I would, however, love to see a non-flamed Johnney sometime in the future. Until petty embargoes finally pass, I’ll just sit here quietly with my fingers crossed hoping that Mr. Fantastic and Thing hit Walgreens shelves with no issue. We’re this close to having a competent Fantastic Four team, let’s finish it out. And then make variants and redo Dragonman after that’s done! 1. Cyclops/Dark Phoenix – This was the remake I’d been waiting for, and boy did Hasbro deliver! Not only did we get an incredible Claremont-style Cyclops and Dark Phoenix, but the set came with enough heads to fix some of our older figures. You know, like the Phoenix in the Juggernaut build-a-figure wave! The only issue that I have with this set is that I want more. Cyclops also slightly got the short end of the stick, a screaming head would have been perfect. Either way, this is my figure(s) of the year. I’m an easy mark for X-Men figures, but this set satisfied me in every way. Make more X-Men two-packs, Hasbro! And that Professor Xavier build-a-figure wave that consists of 6 different versions of Professor X. So that’s it folks, Happy New Year, and thank you so much to those of you who are still here reading my drivel. I’d love to hear what everyone else’s favorites were for 2017, and what you look forward to in 2018.